The month of October means casinos are pulling out all the tricks and treats with Halloween-themed games, and Winaday Casino is no exception. 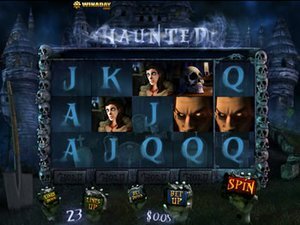 Winaday's Halloween game for this month is the Haunted Slots. While it was released last year, it's still one of the most popular slot games around. Every time a player racks up 500 spins, they get entered into a random drawing. This drawing truly is completely random, and winners may not know if they've won until next month. Prizes range from $50 to $250, although VIP players will earn twice the amount. Haunted Slots is always big around Halloween due to the ghosts, goblins, and vampires that haunt its reels. The game features 23 pay lines, a number of different bonuses, and more. It can be played both for free or for real money, plus it's available on the casino's mobile app. Even if they don't win the random drawing, players have a chance to win a number of different prizes, including a 1,000 coin jackpot. One of the most interesting things about the Haunted Slots random drawing is just that: it's completely random. It doesn't depend on how well a player can play or how much money you win or lose. Anyone who has entered can win. Of course, if you play more often, then you do get more entries into the drawing. Winaday has several other great promotions players can take advantage of. In fact, those who join this month can take advantage of the casino's new player matching bonus. The first deposit receives a 100 percent match bonus, which is good on any deposit up to $250. They will then get a 25 percent bonus on their next four bonuses. There's also a free $50 for every $500 a player deposits. But wait, there's yet another random bonus. Every day, a player who has played and made a deposit within the past seven days has the chance to take home the Winners Every Day prize. This prize can be as much as $100. It all depends on how much has been deposited on the day the player wins.